Over the years, civil societies have made a clarion call for a revenue management framework for the mining sector to help the citizenry follow through on its disbursement to allow for proper accountability. Yet, the response to this has been very slow from the government. Ghana discovered oil in commercial quantities in 2007 and recorded its first revenues in 2011. In the area of mining, dating back as far as 1493, Ghana at the time, was producing 36% of the worlds gold production between 1493 and 1600. That is why the country’s colonial name was “Gold Coast”, reflecting the importance of the mining sector, particularly, the gold trade to the country. What is Extractive Industries Revenue Management (EIRM)and which laws govern it? EIRM are a set of robust policies, regulatory, transparent and legal frameworks which guide how decisions on the exploitation of natural resources are taken and how revenue is distributed in a transparent and accountable manner for the benefit of citizens. 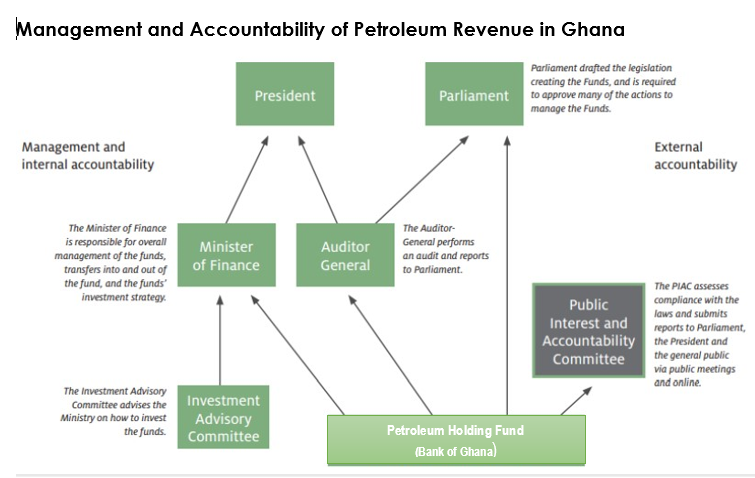 Revenue management in Ghana’s extractive sector is governed by the Petroleum Revenue and Management Act (PRMA),2011, amended in 2015(Act 893).The act gives rules for the collection, allocation and management of petroleum revenues whereas no comprehensive revenue management law exists for mining except for the Minerals and Mining (amendment) Act 2015 and the Minerals Development Fund Act,2016, which briefly speaks to the modus for the payment of royalties and the provision of financial resources for the benefit of mining communities, host district assemblies, stool lands, administrator of stool lands and traditional councils. With the existence of the Petroleum Revenue Management Act, one is able to track what has been collected, disbursed and managed. It also prescribes the establishment of oversight bodies, a formula for revenue distribution and sets clear objectives of how and where to. This cannot be said of the mining sector, which has 80% royalty going to the consolidated fund. With respect to petroleum, revenues are not spent in line with long term national goals. For e.g. Government, in the 2017 budget statement selected Agriculture, Education, Health, Road, Rail and Critical Development as its priority areas for the 2017-2019 financial year. From figure 2 & 3 one is not sure what government priority is. This again raises concerns on economic diversification bearing in mind post resource depletion consequence and the need to ensure proper structural transformation to deliver high output, employment and poverty reduction. Again, this may have negative implications on the structure of the economy as well as stifle growth in the agriculture sector. Thirdly, the capping of the Stabilization Fund deviates from the intended purpose of the PRMA in establishing the Stabilization Fund. Furthermore, the absence of the Investment Advisory Committee is a significant violation of section 29 of the PRMA and may not have been sound investment decisions. Another danger is the political nature of persons who may be appointed to serve. To add to the above, Ghana’s PRMA in its current form may not be fit for onshore revenue allocation of oil and gas because it does not provide a formula for the sub-national allocation of revenues to resource host communities. Again, the support of the Public Interest and Accountability Committee (PIAC) by the government through the Annual Budget Funding Amount (ABFA) poses a threat to the sustainable delivery of proper oversight functions of PIAC, should there be protracted periods of bearish oil prices and (or) supply disruptions – a factor which may cause PIAC’s budgets to be cut down or delayed. Again, with regard to PIAC, the committee is not vested with prosecutorial powers which makes it “bark” without biting. On the mining front, Ghana does not have a mineral revenue management law in place, it therefore has implications for how and where to invest mineral revenue, the creation of sovereign wealth funds, establishment of independent oversight bodies among other accountability and transparency measures. First of all, over-dependence on resource revenues in funding government programs if not checked may be inimical to the nation. For instance, in the 2018 budget statement, total expenditure allocation of GH₵468.73 million was made for education of which an amount of GH₵ 2.83 million (representing 1%) was expected from government. What this means is that, in the event of supply disruptions due to some unexpected shock or protracted bearish prices, government’s plan will not be realized. The increasing sophisticated nature of corruption in the extractive sector i.e. ; transfer pricing, thin capitalization, bloated production and product sale related charges is difficult to detect and takes a long time to detect and may erode future gains from the sector. Thirdly, capacity-deficit on the part of the revenue authority may hamper the collection of resource revenues especially when proper organizational succession plans do not exist to ensure knowledge transfer. Finally, due to the absence of a revenue management framework, we may not be able to accurately account for revenues from mining to posterity. The Internal Audit Agency should collaborate with the Auditor General’s office to effectively conduct pre and post audit of expenditures from the petroleum holding fund in line with its mandate. A review of the cap on Stabilization Fund (SF) by parliament to rather spend interests on SF for debt repayment. An amendment of the current Petroleum Revenue Management Act to include provisions for subnational revenue sharing formula and management for onshore petroleum revenues as in the case of mineral royalties. These provisions should allow statutory payments of a percentage of petroleum revenues by central government to oil host communities – usually directly impacted by exploration and exploitation activities. Financial independence of PIAC is key. Resources given to PIAC to run its secretariat must be charged to the consolidated fund and must be released in a timely manner as long as the country continues to exploit hydrocarbons. There should be a deepened collaboration between PIAC and state agencies like EOCO, OSP and the Auditor General to ensure that our revenues are protected. Enact a mineral revenue management law similar to the Petroleum Revenue Management Act 2011 (Act 815) to guide the disbursement and utilization of revenues in the mining sector. This will guarantee more efficient management and the use of revenues from the mining industry. Potential Risk to Proposed Solutions. In spite of the above proposed solutions, implementation of the above solutions will not be devoid of risk or concerns mainly due to ideological differences of political parties, human resource concerns, the use of supermajority in parliament to vote against well-meaning dissenting views, lack of political will and economic concerns. yield the needed dividend, witness improve scores in the Resource Governance index and would ensure sustainable development.